Wine of New Zealand. Single Estate Wine - Sustainably accredited. Purity to Ara means from a single source. 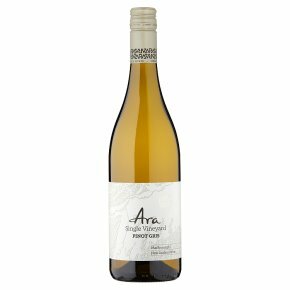 All Ara's wines are produced from our sustainably managed vineyard - hidden in a valley in the most south western corner of Marlborough. This Pinot Gris is a pure expression of our single vineyard, delivering delicate aromas of pear and nectarine which flow through to honeyed floral and citrus notes, on the palate.